Anthony Gargano , sports talk announcer of 610 WIP and author of a new book, A Sunday Pilgrimage, recently sat down with Jules Pilla of InsideTheEagles to discuss his new book. InsideThe Eagles : Ant, thanks for sitting down with me to tell the readers of InsideTheEagles about your new book. What is the name of your new book and when can the fans get a copy of it? 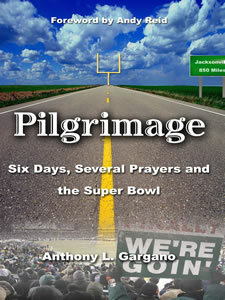 Ant: The book is entitled "A Sunday Pilgrimage." It's due out Sept. 6, published by Middle Atlantic Press. ITE: "A Sunday Pilgrimage", how did you come up with that name? Ant: Simple! Last season's Super Bowl run, I thought, was such a wonderful ride, particularly after the three straight losses in the NFC Championship Game. It's been such a journey, one that mirrors almost a spiritual pilgrimage. Think about it: Jacksonville was the destination. And Philadelphians turned that city into Phillyville, dubbed by Ike Reese. While the Birds didn't win the game and attain the most coveted prize, the Super Bowl represented our revolving Mecca. ITE: You obviously have a geniune love of the city, its fans and its teams, can you tell us where that came from? Ant: I grew up in this town, spending my childhood and teenage years splitting time between South Philadelphia and South Jersey (Washington Twp). What happens in our formative years is what stays with us. While my career took me to Chicago and New York, where I traveled extensively as a national correspondent, the opportunity to work in your hometown in front of family and friends is much desirable. The Delaware Valley has shaped who I am as a person. I am extremely proud of this city. To be from here. Since my career took me in a very public forum, I felt it was my duty to preach the goodness that emanates from Philadelphia, particularly since it is always under attack from a national perspective. I adore these teams, to this day, through covering countless games all over the country, from Super Bowls to NBA Finals to World Series to NCAA Tourneys, to profiling the brightest stars in sport. They are part of me, part of my childhood that I can always look back upon. Thus, when I view them, I can be the 12-year-old kid idolizing Jaworski and Doc and Schmidt and Clarke. There's an attachment that's more like a bond. They represent a simpler time in my life, a happy time, and just seeing their emblem, no matter how many times they change it, brings me back to that so very comforting place. ITE: A lot has been written about the city of Philadelphia sports, what compelled you to add to that body of work? Ant: I was so moved by the experience. I had been gathering material about the Eagles for the past three years while writing magazine pieces, and I was going to write a book during the season they lost to Tampa. So already had it in my mind. The two weeks between the Title Game and the Super Bowl, I knew I was going to do it, win or lose. Standing in that tent doing a simple radio show, and seeing the unbridled joy on the faces of these people, I knew I had to capture that moment. It was singularly unique in all of my experiences covering sport. ITE: Can you tell us what the book is about? Ant: The book captures the journey through the eyes of a cast of characters. From my own personal relationships, the group of guys I grew up with, lifelong friends that I'm sure many of you can relate to, to the rabid fans to the Eagles themselves. The book transcends football. It's really a story of people and how this event known as the Super Bowl brought everyone together. I humanize some of the members of the Eagles. I hope I was able to convey a different side of Andy Reid and Donovan McNabb and Jeremiah Trotter and Ike Reese, and these people who become part of your family because you're with them every Sunday. It gives you some insight into who they really are. ITE: What was your favorite part of the book to write? Ant: Ah, so many parts, it's hard to narrow down. I enjoyed detailing the story of Terrell Owens and Eagles trainer Rick Burkholder. I tailored their tale after Dickens -- "The Prominent Man and the Innominate Man." It's really good inside stuff, too; how Owens was really ready to play in the Title Game, how he came to play, without clearance from his surgeon; how Burkholder got him ready to play and how this man is more than just a guy who bandages up players and rubs ankles. I also enjoyed The Tale of the Two Butches, about Eagles security director Butch Buchanico (he's the guy you always see next to Andy with the mustache) and his son. Butch is a former decorated cop and has amazing stories to share. There is also an interesting section about Ray Didinger, one of the great people in our town. I started out talking to Ray for background, and it soon became apparent that he would be a wonderful character. He is a part of Philadelphia's First Football Family. You will love his story. ITE: Did you have fun writing the book? I understand many fans helped contribute to the book. Can you tell us about that? Ant: Oh, God, it was so utterly fulfilling. I quite enjoy my radio show, but I will always be a writer first. I can be totally myself, expressing who I am through words. Truthfully, I'm most comfortable behind a laptop than a microphone. As long as I can remember I wanted to be a writer -- when I was in second grade and my mother asked me what I wanted to be when I grew up, I said, "Oscar Madison." So the four months I spent holed up in my house writing over 100,000 words (about 325 pages) while laborious at times, was truly rewarding upon completion. Remember, a writer hates writing but loves having written. The fans were quite instrumental in this book. I met with quite a few of them, most who are callers to my radio show. They shared their stories with me, a trust I take very seriously. I saw the unadulterated passion in their eyes -- and I swear their soul. They were my muse, and while the members of the Eagles were fascinating and helpful, the fans are what made that journey. They are what it a Pilgrimage. I remember talking to a friend of mine from Sports Illustrated -- a wonderful writer by the name of Gary Smith -- and he told me: "The Philly fans have taken over the most corporate event in sports and brought it back to the fans." I was so proud of them. ITE: Do you love Football the most of all the major sports in the city? Ant: While I consider myself a true sportsman, with a love of hoops and baseball and hockey, everything else pales compared to football. It is the greatest game ever invented! So many men working in concert to succeed. I love the strategy involved. I've been fortunate to spend a lot of time around a lot of football coaches, obviously most recently Andy Reid, and I've learned much about the game from each one. I love everything about the game, particularly the cadence of it, from the physicality of say a Runyan to the art of a Westbrook, melded together. I live for Sundays. I've always said someday I'd like to live abroad and travel -- but I can only do so if I am afforded my DirecTV and Sunday Ticket. ITE: What is it about football that makes this city go so crazy? You know it as much as I do that the fans of this city live and die with the Eagles. What do you like about Eagle fans ? Ant: This city has the soul of a football town. I explore this notion quite extensively in the book. The obvious reasons are the blue collar and parochial nature of the city, but I also think it goes deeper, back to the Quakers, who left their mark and hard-working ways in the soil. This town loves grunts and it loves hard work and it loves heart, and football encompasses all three. We're more literal than literary, which I think separates us from baseball Boston or baseball New York. Philadelphia is unplugged and football is unplugged. What I like about these fans is simple: PASSION. They are real people. In a world of phonies, they are as real it gets. Ike Reese and I talk about it all the time. Ike has become a dear friend, and he cherished playing for these people. He once said to me: "Because of these people, I felt it an honor to play for the Eagles. I thought it was just cool." Ike, by the way, is a true Philadelphian. He's a fan of all sports, but obviously football. Most athletes think it's cool not to follow their own sport. Not Ike, he watches games like we do. He was also quite instrumental in helping me write this book. He was by my side through most of it. He's in Atlanta now, but he'll be back here in another capacity. Ant: If the Eagles do win the Superbowl, what do you think this city will be like? Ant: Oh, my, just to experience it once. It will be rapture. Many have stated they think the fans will burn the city down. I don't believe so. Maybe I'm blind, but I think it will be an outpouring of love and celebration. I think we saw a glimpse of that after the NFC Championship Game. I was so proud of the way the fans celebrated. Can you tell us why the fans will enjoy reading this book? Ant: There's a couple of reasons: The book captures the inner-workings of this football team and paints a picture of who these people are. There are stories in here that have not been heard before. It's also a story of people. The profiles of many with such interesting lives, like the one fan who turned his life around after getting arrested twenty-five years in Jacksonville, only to redeem himself, becoming a good husband and a good father, and returning to the scene of his crime. It's the story of this journey, and why we acted the way we did. Plus, you get to relive it all over again while going through the upcoming season. Ant, I want to thank you for taking the time out of your busy schedule to sit down and tell us about your book. Is there anything you would like to add before I let you go? Ant: Yes, I would like to thank the fans for making this happen. I created a work that I'm extremely proud of and it's because of them. They are such a special group, and I will champion their cause forever.